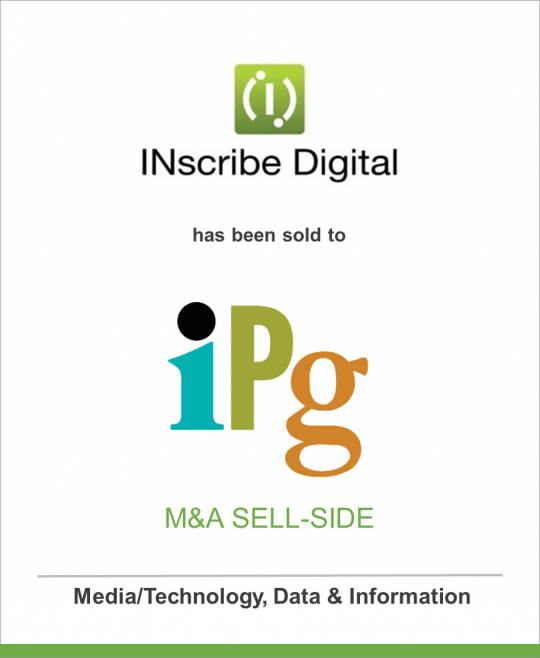 DeSilva+Phillips Investment Bankers announced today that its client INscribe Digital, a leading eBook distributor, has been acquired by Independent Publishers Group (IPG). The acquisition includes INscribe Digital’s distribution platform, marketplace monitoring tool, 300+ clients with over 65,000 titles and the INscribe Digital staff. DeSilva+ Phillips Investment Bankers acted as sole financial advisor to the shareholders of INscribe Digital’s parent company, Isolation Network, a portfolio company of Shamrock Capital Advisors. The transaction was led by DeSilva+Phillips Managing Director and Publishing & Education group head, Robin Warner. The acquisition provides IPG with a state-of-the-art digital distribution platform that will be leveraged to service its entire client base. INscribe Digital clients will have access to the IPG distribution network, including over 100 eBook retailer partners. The acquisition will also open up new print distribution options for INscribe Digital clients. “The book publishing industry is embracing technology and innovation. IPG has adeptly recognized that this represents new opportunities. INscribe Digital’s technology platforms and talented team will help IPG continue to be one of the sector’s market leaders. A solid win for INscribe, IPG and, most importantly, their customers,” said Robin Warner, Managing Director, DeSilva & Phillips. Formerly a division of Isolation Network, INscribe Digital is a technology company specializing in next-generation publishing services and tools. Based in San Francisco, the company has distributed more than 65,000 eBook titles on behalf of major book publishers, university and independent presses, literary agents and authors. INscribe’s Athena content delivery platform provides maximum transparency in distribution and sales reporting. Strong retailer relationships enable the company to deliver customized marketing and sales solutions for diverse clients at a range of retailers globally. INscribe’s seasoned team of book industry professionals leverages a decade of experience in delivering music and other digital media assets to leading retailers worldwide. INscribe Digital offers flexible and scalable solutions for Book production, conversion, marketing and distribution. Established in 1971, IPG was the first organization specifically created for the purpose of marketing titles from independent presses to the book trade. With consistent growth year-over-year, IPG’s success has come from supporting and encouraging the growth of its client publishers in the United States and worldwide. IPG has a wide reach in the market through its distribution of publishers with academic, Spanish-language, computer and general trade nonfiction and fiction titles. IPG was acquired by Chicago Review Press in 1987. Clients include publishers from the United States, United Kingdom, Canada, Ireland, Israel, Spain and other countries. In the fall of 2006, the senior management of Chicago Review Press, Inc., the parent company of IPG, bought Trafalgar Square Publishing, Inc., the leading US distributor of UK publishers. Trafalgar Square Publishing was founded in 1973 and distributes for clients such as Canongate UK, Hodder & Stoughton, Headline, Orion Publishing, Random House UK and Simon and Schuster UK.